Learn to recognize music scales by ear. Is there a better alternative to ScalePhobia? Is ScalePhobia really the best app in Music category? Will ScalePhobia work good on macOS 10.13.4? 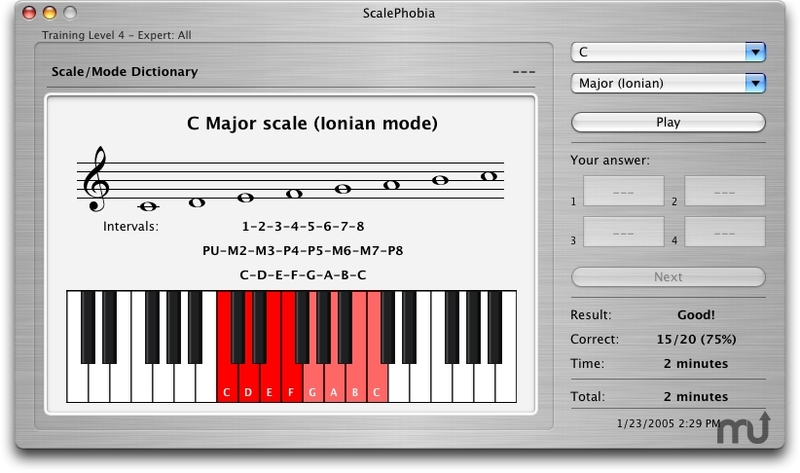 ScalePhobia has been designed to help you learn to recognize scales and modes when you hear them. In ScalePhobia, you will see/hear most of the scales/modes from the major scale to the Locrian mode. Scale/Mode Types: Major (Ionian), Natural Minor (Aeolian), Harmonic Minor, Melodic Minor, Dorian, Phrygian, Lydian, Mixolydian, Locrian, Whole Tone, Blues, Major Pentatonic, Minor Pentatonic, Whole-Half Diminished, and Half-Whole Diminished. Play Modes: Scale/Mode Dictionary, Training, and Lesson. Added "Core Solo" and "Core Duo" Mac support. ScalePhobia needs a review. Be the first to review this app and get the discussion started! ScalePhobia needs a rating. Be the first to rate this app and get the discussion started! Note Orders: Ascending, and Descending.